The antiques programme heads to the Midlands, as experts Adam Partridge and Thomas Plant set about valuing the gems at Dudley Concert Hall. who shared the name of the town we're in today. 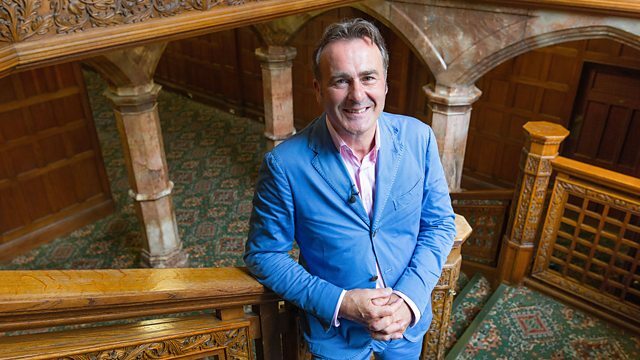 Welcome to Flog It from Dudley. John Dudley, in the 1500s. in a plot to prevent Mary Tudor from becoming queen. The plan backfired. It went horribly wrong and the young couple were beheaded. Shortly after that, John Dudley's head rolled too. as they hunt out the best items to do battle with at auction. to see if their items can catch the experts' eye. First to put his skills to the test is Thomas Plant. and so on and showing them to me. or collecting money or postcards? What did he like the most? It was the collectability factor. He just liked to have things to keep. Yes, I can understand that. Why have you brought them today? I was curious, really, to see if anything was of value. -or think, "Oh, wow! I'm after that." You're doing the right thing. Although it's not going to be worth a king's ransom, it's of value. Postcards, people like to collect them because they fit into their collections and they tell a story. -because they're all First World War. -They're moralising ones as well. This is what we call a sweetheart card. -It was bought within Flanders, somewhere like Ypres, and sent home. To their loved one. Though it's a myth it was done by the soldiers. That's a myth. These were done to be bought by soldiers to send home. -And these are the flags of the Allies. You get collections of these and they make quite a lot of money. cos you don't see things like this. You sometimes get sheets of stamps and people get very excited. But the main interest when I saw you in the queue and looked through the album was this paper money. -No, he kept it. That's right. He kept it in an album and he used to add to it, especially the pound notes. -He was keen on that. -There's quite a few of these in the albums. -Yes. He was keen on that. -They're worth a bit more than a pound. These are worth between five, three pounds, five pounds. -And about 25 to £30. -If you think about all the first-day covers you've got, quite a few. They're probably worth between 50p and £1 each. -So you're looking at £100-plus. ..for the whole collection, with a reserve of £100. I think you need to protect this. -You don't want it to go for nothing, do you? -No, no. I mean, no. -Will you come to the auction? -I'd love to. I've never been to one. Tell me, how do you feel about this going up for auction? -Fantastic. Really excited. I'd love it. -And you have those memories. Nobody will take them from me. But I'd like this to go to somebody who's already got an interest. -I'm sure it will, and we'll have a good day. They usually specialised in various roses or flowers or animals or whatever it might be. Thanks so much for bringing in some natural history. It's a sawfish bill, which is a cross between a ray and a shark. A sawfish is found in temperate waters around the South Pacific. Australia, New Zealand, all the islands round there. A very dangerous fish. Imagine coming across this in the water! This is quite an old fish, actually. It's reached maturity. It's got 30 teeth either side. I would say this example dates back to around about 1850, 1860. It's a nice early Victorian one. Tell me about how it came into your possession. -He asked me if I wanted it. I said, "Yes, I'll have it." Was it on the wall in his house when you saw it? No, he hadn't got it in his house. I don't know how he came by it. It's been treated with a borax acid. That's how they treat it to stop it rotting. so you moved the skin around. Hence taxidermy. And the Victorians, they just loved it. There were so many practitioners in Victorian England, it was unbelievable. Hundreds of them. Everybody wanted a little piece of something from a faraway land. They wanted their own private museums. and we were conquering everywhere, bringing back exotic specimens. I think this would have been one. Imagine it on the wall in a Victorian parlour! Over a doorway or something. It's... I think it's incredible. I really do think it's incredible. And the teeth are so sharp. Of course, you know what the good thing is. -There's not one broken one. it would devalue it possibly by 30%. That much, just for one broken tooth. Well, it's just in the cupboard at home. A lot of people do find these things quite frightening. They're a little bit put off by it. But it's becoming fashionable again. There's a resurgence. People are collecting mini museums of taxidermy items. to an academic, somebody who likes this kind of thing on their wall. So what sort of figure do you have in mind for this? Well, I was told it was worth 500. But I'm happy with what I get. I'd like to think this will fetch around 100 to £150. -OK? We'll put a reserve on of £100. I'll see you in the auction room, Cliff. You brought along a violin. Everyone heads for me with violins. -I'm known as the violin man, these days. Hopefully, you're in good hands. -First of all, where did you get it from? -I had it out of a skip. -Someone threw that in a skip? -The case and everything? With the bow? -What were you doing in a skip, David? -A lot of people find good things in skips. -I've had many a good thing. -What else? Tell us some good stuff you've found. -Ever had a really good find? -I had a silver hand mirror once. I took that into a second-hand shop and got a fiver for it. -About 20 years ago. It was OK for me at the time. it's a fairly ordinary violin, too good to throw out. or thereabouts. So it's got a bit of age to it. It's hard to be specific about it. It's almost definitely made in Germany. Most old violins were factory-made in Germany. It's not rubbish, but it's not particularly valuable. You've got a pine table here. The belly of the violin is called the table. And the back is maple. Made from maple. It's a two-piece back. You can just see the dividing line round the back. How would you describe the condition? but nothing major, no cracks. -It wouldn't give a proper sound. Presumably you've brought it in to flog it - for what reason? Cos you don't play it and you want to sell it. it would be nice restored or whatever. That's right. You could clean it up quite easily. -So cutting to the money, it's probably worth about 40 to 60 in auction. -So it's not too bad. In the first year alone, we built over 1,700 vehicles. and who's heading off to auction. and take on this collection. as it goes under the hammer? Fieldings auction house in the heart of Stourbridge. And the auctioneer flogging our items for us today is Nick Davies. So, let's get things under way. -This was found in a skip. turning this into hopefully 40 or £60. I can't understand why anyone would throw it in a skip. And a bow as well with it, in the case. -Been some interest, I believe? -I'll open at £60. Six-zero. 65? 70? You're out. 65 in the room now. The commission bid is out. At 65 I'm selling it. All done for the fiddle at 65? Done? -How does he know it? It's got to be a fiddle! When you know, they're easy. -It is for me. Yeah. -A little birdie tells me you're taking the wife out. -Nick, you're selling off grandfather's collection. -Lots of paper money, postcards, first-day covers. Nice little lot, actually. Will we get that top end of the money? -These items of social history do really well. -I've done well with some postcards. This is mainly first-day covers in this collection. You've heard what we think. Let's see what that lot think. It's under the hammer. Good luck. Three 1970s and '80s first-day cover albums. A small selection of First World War postcards in the lot as well. I'll open at £85. I'll look for 90 in the room. Anyone coming in at £90? We've got £100 with discretion. -I'm going to have to pass these, I'm afraid. Anyone coming in at £90? Any interest? No? -Maybe it's meant! Maybe Grandad's thinking, "Keep these." -Cliff, great to see you again. This sawfish bill is the only item of natural history here. So it stands out alone a bit. the chap on the rostrum, the auctioneer, there. He kind of hinted bottom end. Not his thing, but he said, "Paul, it should sell." Time to wave goodbye. Here it is. properly known, apparently, as a rostrum. Where do you start on this? Lot 673. Bids and interest. I'll even it up and ask for £200. Anyone coming in in the room at 200? 195 takes all the other bidders out again. 200 anywhere? -At £195, I'm selling it. Yes! Hammer's gone down at £195! -Nick was slightly doubtful at first, but that's good news, isn't it? and worked it up for us. -You've got to be pleased with that? The grandchildren will be pleased. There's one here. I'm nipping across to Dudley's museum to learn about a local talent. on the cliffs at Brighton. A lone walker lost his life. That man could have become one of the most celebrated British artists of his generation. Yet over the last 60 years, only a few people have heard of his name. and his artwork was exhibited at the Royal Academy in London and at the Paris Salon. the town's art school, which is now Dudley's museum and art gallery. But for young Percy, becoming an artist was not going to be easy. living in Dudley's crowded terraces, a slum area. and find similar work to help his struggling family. shone one bright light - the art school. a place at the art school. Percy thrived under Ivo's strict approach to teaching. should be mastered before launching into freer forms of expression. had it not been for the dedicated work of the Dudley Museum and one man. is the principal's son, Robin Shaw, and he's right here. Robin, pleased to meet you. Thank you for talking to us. What made you play detective and research this wonderful local talent? Ivo Shaw, was terribly upset because he had such high hopes of Percy. -Your father nurtured him, didn't he? and paintings on the wall. I would find out more about Percy. -Can we have a look at them? and I've had them at home ever since. These are art school studies. -Most of these were done when he was 18, 19, 20. They've got so much movement. So much maturity for an 18-year-old. Yes. Of course, these two are my mum! -She was a fellow student. Later, of course, she married my father, Ivo Shaw. and it caused a bit of eyebrow-raising in those times! But he married her, didn't he? -It was a happy ending. Percy drew the people that surrounded him. Friends and colleagues became his models. Barbara, it's definitely you. You haven't changed much! I think six or seven, something like that. I'm not sure. Can you remember what he was saying when he was sketching you? He was sort of chatting generally. He asked me about my pet canary, which he was acquainted with, having visited the house. -So he kept you entertained? It shouldn't have been boring, but I was too young to sit for any length of time! -Were you pleased with it when you saw it? -Yes, I was quite impressed. And what happened to this picture? it was stored away and I noticed the mount was getting foxed. so I thought Dudley Gallery was the proper place for it. who were rejecting the experimentation of the post-Impressionists. I like these two portraits. Different mediums - oils on canvas. Tell me about them. Start with that one. It looks like the Rhine. Did he travel abroad? A local lad from Dudley didn't do much travelling! to the Rhineland, the Mosel part of Germany. and this picture reflects it. which is there, in this portrait. -Healthy, powerful, outdoor woman, yes! That was the term used then for people of half black, half white origin. It's clearly a celebration of her beauty. I think Percy really likes that girl. It was the first painting which was accepted by the Royal Academy. gives you so much kudos, such a lot of weight as an artist. -And it puts the value of your work up. -for Dudley, for the art gallery. And, of course, Dudley paid for it. It was our first sale, I think! And he wasn't going to get many more sales. These, totally different. We're moving on now. He's teaching by now, isn't he? He's a serious painter, isn't he? He is a serious painter. for each figure in these paintings and built up a composition. -Together they show what life was like, leisure, in the '30s. the opening of Dudley Zoo. and Percy painted this to celebrate it. Wow. He's really stamped his mark at this stage. He is the master of the genre. But this is what I want to get to cos I love those legs! I really do! That's a cracking pair of legs! but it's not Dorothy Round, it's a model. But it's about the same time as Dorothy Round was winning the ladies' singles at Wimbledon. And this one, this is the lazy, hazy summer days, I guess, in the 1930s. A leisure scene. Yes, I think it's Cannon Hill Park, Birmingham. "The Boat House". -The angle. It's painted as from above. -He was very influenced by the cinema. He loved the cinema. -The wide lens, moving the perspective. The way he positions some of the figures are like camera shots. -and the leisurely times people had. He was building up a body of work which showed what the '30s was like. Sadly, these were the last paintings that he did before he was tragically killed. Yes, the last few, really. He was showing them at the Royal Academy right into the beginning of the Second World War. Then he was called up by the Navy. He tried to keep on painting, right to the very last. So, who was Percy Shakespeare? who knows what great works he would have gone on to produce? We're still drawing in the crowds at our valuation day. Adam has met two ladies happy to part with their little friend. OK. How do you two know each other? -We met on holiday in 1989, in Rome. -You met completely by chance? -Isn't that funny, how that happens? -Now, let's get back to Little Monk. You've brought him in cos presumably, it's Flog It, you want to sell him. Well, we haven't got any children, nobody to leave anything to. -So he's surplus to requirements. -Where did you get him from? -My cousin was an estate agent and auctioneer. My father used to help when he had auctions. -He came home one day and said, "I've brought you something." He gave me that. I didn't know it was a candle snuffer then. -When did you find out it was a candle snuffer? -When I went to Worcester. -And saw the other ones. It's by Royal Worcester, of course. which date it to 1913. The vary in terms of their desirability and commercial value quite considerably. and some make 30, 50, that sort of thing. -Joy, what's your opinion of Little Monk? -I think he's very sweet. Very sweet indeed. He doesn't look to have been used much. -I wonder if they ever were. -You don't see many that show signs of usage. He's very clean inside. So this one, I would estimate at 50 to £80 at auction. -So it's not great, but it's better than nothing. -If somebody likes it, that's best. -That's right. Happy to sell him? -Yes? We'll put him in the sale with 50 to £80 estimate. We'll put a reserve of 50 so that he doesn't go for any less. It's not a lot of money so I presume it'll be spending money for your next holiday? -Really? Where are you going? -On a cruise to Madeira and the Canary Isles. -Off to celebrate the diamond wedding anniversary. We'll take care of Little Monk while you're away and deliver him to auction. -Tell me about your train set. -This is a quarter of a set that my father had. Four locomotives and loads of carriages. When he passed away, my three brothers and I shared it. -So this is my quarter! But it's been sat in my loft ever since. -You've never run it since? Tell me, when your father was alive, did you run it with him? -And when did it stop? -When we had fitted carpet! -Fitted carpet instead of lino floor. -That would be 1958, '59. So it hasn't been played with for a long time? It's certainly not been played with for 40 or 50 years. So it needs to go to an enthusiast, doesn't it? -It needs to go to somebody who would look after it and treasure it and use it. But you have got a big mixture of tin plate trains here. -But they're all O gauge. -That's the gauge we're looking at. -We've got O-gauge signals, made by Hornby series here. The fitted box for one of them. -We've got a Hornby Pullman's restaurant car. Then we've got a LMS Bing. -This is a German-made tin-plate O-gauge carriage. -Two Bing LMS carriages here. -And a Bowman's spirit-fired locomotive. -A dream to some person! -Maybe a dream to some person. -It's a mix. It is a mix. There's Hornby, there's Bing, spirit-fired locos. But it's all O-gauge. -And to top it all off, you're running on a three-rail track. -Which is an electric track. -Which are more valuable than anything else! -My two elder brothers had the expensive ones! OK. But still, they're very attractive. it's best to sell it as a lot rather than dividing things. -the certain bits and bobs together, I think we get to that figure. I could be wrong, but I don't think I am. It's fine. -and hope it makes 250. -How do you feel about a discretionary reserve of 200? -I'm happy and content with that. Yes, indeed. -We'll do that for you. Will you come to the auction? -I will. I will. Look forward to seeing you there. -Absolutely. I'm excited to see how well they do. I'm glad you came cos you've brought a lovely set of napkin rings. They originally came from my great-grandmother. -My grandfather had them and then they came to me when he died. -So you've had them 40 years or so, probably. It's always interesting to find out. A lovely set of napkin rings, hallmarked silver, all numbered. One, two, three, four, five, six in their fitted case. Presumably you don't use them? I have used them when we were in our bigger house. We've downsized now. I haven't got a dining room. I did use them when we had a party. -I bet they looked fabulous. -When we used to have friends round. They're nicely decorated as well. Let's take out number two. which is in keeping with a dinner party, wine flowing and everything. We've got a hallmark on here as well. And that little "Z" there is the date letter for 1899 to 1900. -So they're just on the turn of the century. It makes them late-Victorian. -they're gilded inside as well. Which is very nice. They've obviously had very little use. to go back to Mauritius where my son got married in 2000. He'll be married ten years in 2010. He wants us all to go again. So we're going to put any money we make on anything towards that. -Good idea. Ten-year celebration of the marriage. -Yes! Past the seven-year itch! -You can't say that for all marriages! -I mean, the value's not huge. I would estimate these at 80 to 100 for auction purposes. -I would expect them to make 100. -I thought about the 100. But I'd want to put a reserve on them. -I would suggest £80. How do you feel about that? -Let's cross our fingers for over 100. -Yes, I have it on the fireplace. contemplating a recent love or something. I don't know! Is it like an Art Deco? and then you have another one. That's why she's sitting there thinking, probably. I mean, I think she's going to make about £100, maybe a bit more. If some candles need snuffing, Thelma's Royal Worcester monk is just the thing. Secondly, some fancy Victorian napkin rings belonging to Val. And finally, David's train set. This varied collection should track down some bidders! Thelma and Joy, good to see you again. I'll have to smarten myself up, I think! We're selling your candle snuffer. It's Worcester. It's a little monk. Do you like the candle snuffer? -No, it's very clean inside. We've seen them before, Adam, and they always tend to sell cos they're quite rare. There's lots of different models. -They vary massively from £50 to a few thousand sometimes. Like me, I'm a bit of a monk with my hair loss! -Around there. Any more would be a nice bonus. -This is it. This is it. A candle extinguisher, candle snuffer. The model is a monk. Lot 115, we're bidding on. for the Royal Worcester? 48 anywhere else? At 48. I've got you. 50 anywhere else? At 48. Gentleman's bid. It's in the room. 50 anywhere else? £48. I'm going to sell it. Are we all done for the Worcester snuffer? £48. It's down, the hammer. It's gone. Just a couple of pounds shy of that £50 mark. -He was. He was scared! We've got the silver napkin rings and a valuation of 80 to £100. but we do have Valerie's daughter's father-in-law. -Have you seen these napkin rings at all? You can't really comment on them. Fingers crossed. -Adam's well on the money for this. -Should be all right. Not a tricky thing to value. There are six of them. Could we see a little surprise? Could see 120, 150, perhaps, but unlikely to be more. I'm not promising that, but they should sell. Let's find out right now. This is it. Hallmarked silver napkin rings in their original case, numbered. -Lots of bids and interest. £140. Do I see 150? Thank you. 160? 150 in the room now. 160 anywhere else? At £150. In the room at 150 for the napkin rings. -All sure and done? £150. Yes, a good sold sound. The hammer's down. -£150. She's going to be so happy with that. -We'll leave it to you to ring and tell her. Do you think she'll share the profits with you? This is a cracking lot. I like this and Thomas fell in love with it. because I'd keep it for the rest of my life. I love those carriages and that lovely engine. A large collection from my father's days. He had four engines. The three brothers split them between us. -And this is the last of your section? Will we get £300, that's what I want to know. We've got a good chance. It's the only train in the sale, but it is superb. It should have dragged people here to buy it. Lots of bids and interest. 225 I'm bid. Do I see 230 to get us on an even keel? 230. You're out? 230 at the back of the room. 230 in the room. Do I see 240 anywhere else? At £230 I'm selling. At the back of the room. That's it. It's all over for our owners. Nick's still weaving his magic on the rostrum. We've had a great day and everyone's gone home happy. One or two surprises, but we've enjoyed ourselves. Hope you've enjoyed watching the show too. From Stourbridge, until next time, cheerio! The team head to the Midlands, as Paul Martin and experts Adam Partridge and Thomas Plant set about valuing the gems at Dudley Concert Hall. Paul gets his hands on an unusual piece of marine taxidermy that was just gathering dust in a cupboard; could it make a big splash at auction? Adam dusts off some napkin rings that he hopes will dazzle the bidders, and Thomas plans to keep the bidders' attention with a train set - even if it is a bit of a mixed bag! Paul heads to Dudley Museum to get an insight into the work of local artist Percy Shakespeare, who was tragically killed in the Second World War. His work would have been forgotten had it not been for the hard work of one man, Robin Shaw, whose father discovered this local talent.